I bought a spiral vegetable slicer a few years back and haven’t had the right occasion to try it out. 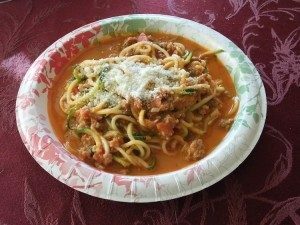 This year are garden is growing giant zucchini’s so I decided to pull it out and make ‘spaghetti’ with our zucchini. It was great! I’ll put a link below to the slicer I used. It was SO easy and made long wonderful strands from the zucchini. This is a pretty free form recipe. You can use any kind of sauce and or meat that you’d like. It would be great with Pesto as well. 1 jar of organic spaghetti sauce any type. Here’s the link for the one I used.